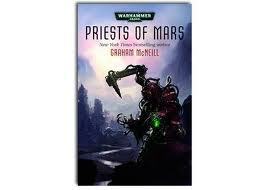 The majority of Graham McNeillâ€™s books for the Black Library havenâ€™t impressed me. Theyâ€™re far too quick to jump to â€˜rivers of bloodâ€™ and â€˜mountains of skullsâ€™ and while those phrases fit nicely in the over-the-top Gothic nature of the 40K universe, they become slightly lacklustre after theyâ€™re used for the fiftieth time. Surely skulls are far too difficult to stack to get to mountain status, and â€˜hillock of skullsâ€™ just sounds silly. ‘Priests of Mar’s is therefore a welcome change. McNeillâ€™s clearly been influenced by other BL writers like Dan Abnett, and descriptions here avoid hyperbole and instead couch the plot in intricate detail, rather fittingly for a novel about the 40K universeâ€™s scientists and technologists. Maybe itâ€™s because there arenâ€™t that many set-pieces in the novel, but the focus here is on the interplay between factions preparing to explore the dangerous and unknown Halo Scar region, and the whole book reads more as a political thriller than a story of the far future. This is in the bookâ€™s favour though; war and death have been adequately covered by the Black Library and itâ€™s fun to read a novel that mostly intrigue instead.